China has embarked on a major reshuffle of its financial regulatory authorities in recent months, combining the nation’s banking and insurance watchdogs and setting up a financial commission under the State Council. Some observers say the move indicates a new approach under a consolidated central leadership. But as the reform is not yet complete, uncertainties remain among investors over the future shape of financial regulation in China. NewsChina interviewed Professor Huang Yiping, an economist and vice-director of the China Center for Economic Research under Peking University, to hear his observations about the reforms. Serving as a member of the monetary policy committee of China’s central bank, Huang has been consulted on the ongoing financial reform and offers an insider perspective. NewsChina: Under the current reforms, the China Banking Regulatory Commission and the China Insurance Regulatory Commission have merged, but the power of drafting laws related to the two sectors has been transferred to the central bank. How significant is the change in terms of China’s overall approach to financial regulation? Huang Yiping: You could say that with the institutional reshuffle, China has adopted a “twin peaks” regulation model centering on two functional pillars – monetary policy and prudent regulation. Under the new institutional arrangement, the central bank will be responsible for making monetary policy, conducting prudential macro-level regulation, and ensuring policies are cohesive, while the new Banking and Insurance Regulatory Commission will focus on micro-financial behavior within the market to ensure its fairness and transparency, and will implement various policies launched by the central bank. We made the new arrangements by drawing on the experience of many advanced economies, such as the UK and Australia, which we believe will help us to ensure the stability of the financial market. NC: Another key element is the establishment of the Financial Stability and Development Commission (FSDC) under the State Council. It appears that the FSDC will share an office with the central bank. How will the functions of the FSDC differ from that of the central bank? within the administrative hierarchy than the central bank. Its main function is to coordinate policies in different areas, including the monetary, fiscal and financial fields. 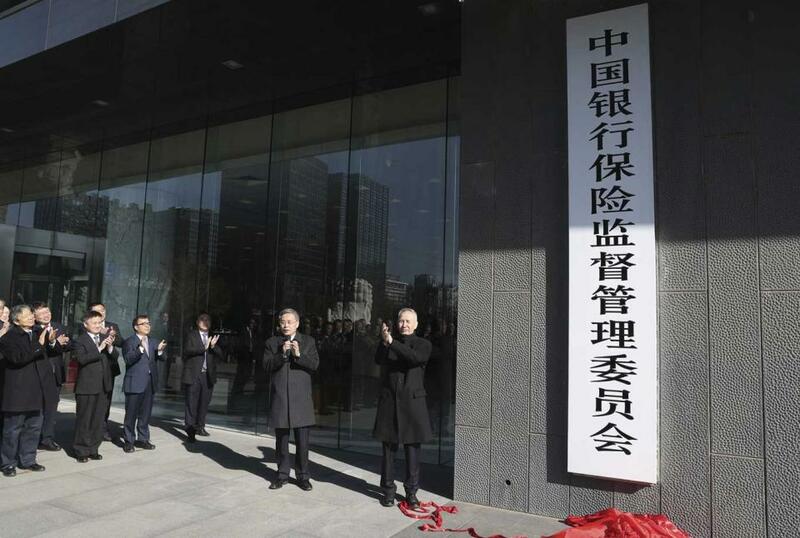 Though it shares an office with the central bank, it will be staffed by officials from the State Council and other departments. Some of its functions may overlap with the central bank’s, especially in policymaking and regulation. This arrangement is mainly meant to resolve the lack of coordination between different regulatory agencies in the previous system. NC: Yi Gang, the new governor of the People’s Bank of China, has said China faces serious potential financial risks, such as a high rate of financial leverage [investing with borrowed money] and “financial chaos” in some places. How does this relate to the reform? HY: In the past years, the effectiveness of China’s financial regulation has declined as a result of various problems with the regulatory regime. For example, it was divided into several sub-sectors supervised by separate and independent agencies – sectors like banks, insurance companies and the stock market. This created some serious problems. It means a lack of policy coordination between the different agencies. Furthermore, as the financial sector evolves and the boundary between the sub-sectors becomes increasingly murky, some market activities fell through the cracks into unregulated areas. As the different sectors have become increasingly connected, regulatory authorities focused on their own sectors often found it difficult to track capital flows in the market, which damaged the financial market’s transparency. As a result, the authorities had difficulty heading off potential financial risks in the market. Finally, and most seriously, the regulatory agencies in each sector were often expected to promote the development of the sector under their supervision, a goal that contradicted their role as regulator. Rather than a regulatory regime divided by financial sectors, the authorities needed an integrated and systematic approach to tackle the issue of financial regulation. To deal with the systemic financial risk posed by the combination of bad bank assets, excessive local debt, and a high leverage rate, a systematic institutional arrangement was needed. This is what the ongoing financial reform is about. NC: Many are concerned the reforms could squash financial innovation, which is often the source of financial risk. What is your view? opportunities presented by financial innovation. On one side, financial innovation can improve the distribution of capital and optimize investment. On the other hand, it can create additional risk for the stability of the financial market. One way to curb the potential risk of financial innovation is to establish “regulatory sandboxes,” especially in the field of internet finance – that is, to set up testing grounds for new business models. The authorities could issue permits or licenses to allow emerging business models to operate in a limited area or locality to see how they adapt to financial regulations. If they prove productive with manageable risk, the authorities could allow them to expand to other areas. NC: One major problem in China’s financial market is the high rate of leverage. However, many sectors appear to have financing difficulties. How should the government address the contradiction? HY: It seems contradictory to have a high rate of leverage and difficulties finding finance at the same time. But it’s because many financial transactions are conducted between financial institutions, and the capital involved has not entered the real economy. Throughout much of 2017, the authorities tried to lower the rate of leverage in the financial sector and considerably reduced the monetary supply. But we haven’t seen a corresponding decline in the growth of total social financing (TSF) for 2017. As TSF measures the finance supplied to the real economy, this suggests measures to reduce financial leverage have not had a negative effect on the real economy, as they mainly focus on reducing capital flows within the financial sector. Therefore, I think it is possible to reduce financial leverage and improve financing in the real economy.